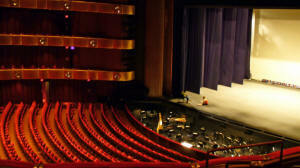 There are many types of theater architecture and the most popular kinds have different effects on the way the audience is allowed to see the performance. The art of theater is one of the oldest and most popular forms of entertainment. Productions can be small, simple affairs involving a few actors and props, or they can be large, using dozens of performers, elaborate sets, and huge audiences. One element common to all productions is the environment in which the actors perform. 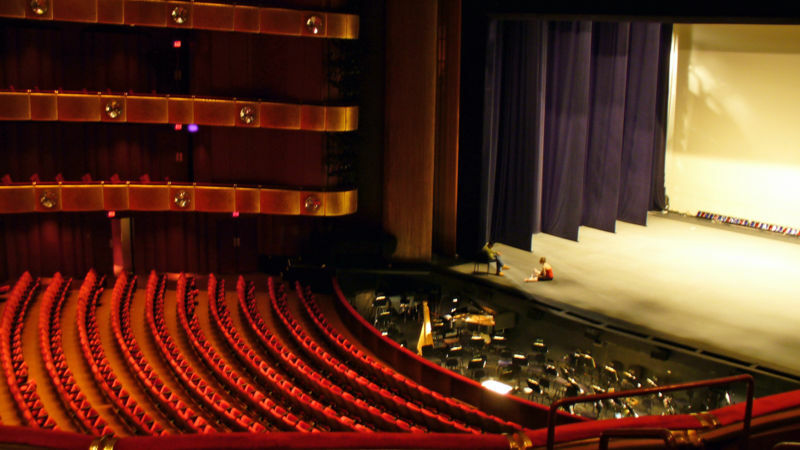 Theaters use many types of stages for different productions and the different kinds of architecture can have a great effect on how the audience perceives the action. The proscenium, or picture-frame, stage is the most commonly used. This theater is named for the proscenium arch at the front of the stage through which the audience views the performance. All action takes place behind the arch and a curtain can be used to hide the area from view of the audience for scene changes. The extended apron, or thrust, stage projects out into the audience past the proscenium arch. The actors can move either in front or behind the arch, or perform exclusively in front of it. Because there is no curtain, scenery is either changed quickly or not at all. The three-sided arena extends far enough into the audience that the side seats are turned to face the stage. All action must be on the projected area; otherwise part of the audience would be prevented from seeing it. The scenery is done much the same as with the extended apron stage. The full arena is created when the audience surrounds the stage on all sides. The actors are allowed more natural movement, not having to focus on an exclusive direction. Scenery must be kept to a minimum to prevent obstructing the view for the audience and scenery can only be changed by moving the pieces up the isles between the audience. 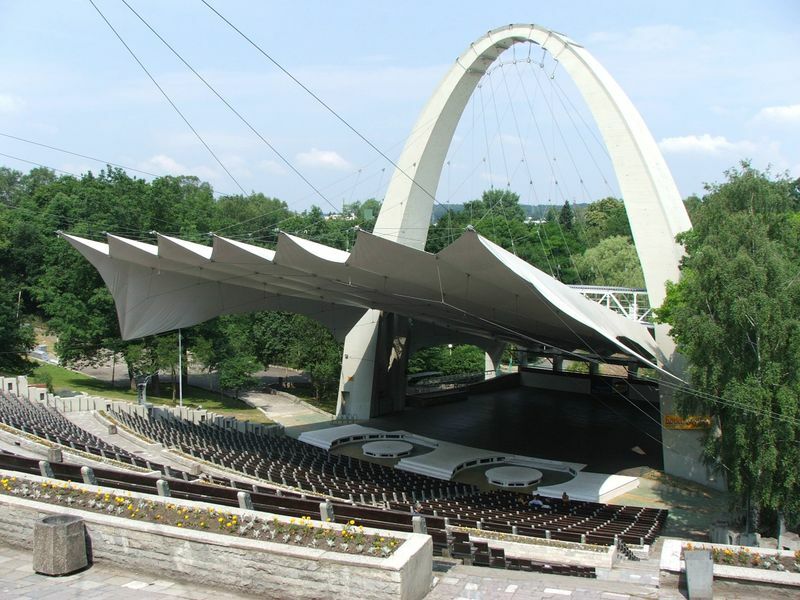 An amphitheater is an open-air structure with tiers of seats surrounding a central area. The seats can curve around the front of the area, as in most musical amphitheaters, or surround it completely, as in the Roman Coliseum. The black box theater consists of a large rectangular room, usually painted black or another neutral color, with seats on one side for the audience and a space for the actors to perform in front of them. Scenery and props are minimized to allow the audience to focus completely on the actors and their performance without distraction. These are generally regarded as the most popular types of theaters, having held the most performances and enjoyed popularity as means of presenting drama. There are, however, many more less widely known stages, from complex structures of many leveled mazes to simple open areas in fields and empty parking lots. It's all a matter of finding the right place for the right piece. Serge Sudeikin's poster for the Bat Theatre (1922). Theatre (or theater, see spelling differences) (from French "théâtre", from Greek "theatron", θέατρον, meaning "place of seeing") is the branch of the performing arts defined as simply as what "occurs when one or more human beings, isolated in time and/or space, present themselves to another or others." By this broad definition, theatre has existed since the dawn of man, as a result of human tendency for story telling. Since its inception, theatre has come to take on many forms, often utilizing elements such as speech, gesture, music, dance, and spectacle, combining the other performing arts, often as well as the visual arts, into a single artistic form. Modern Western theatre is dominated by realism, although many other forms, including classical and experimental forms, as well as Eastern forms, are frequently performed. Drama (literally translated as action, from a verbal root meaning "To do") is the branch of theatre in which speech, either from written text (plays), or improvised is paramount. And the companion word drama is also Greek, dran meaning to do. The first theatre, the Theatre of ancient Greece, created the definition of a theatre: an audience in a half-circle watching an elevated stage where actors use props staging plays. Musical theatre is a form of theatre combining music, songs, dance routines, and spoken dialogue. However, theatre is more than just what one sees on stage. Theatre involves an entire world behind the scenes that creates the costumes, sets, and lighting to make the overall effect interesting. There is a long tradition of political theatre, which aims to educate audiences on contemporary issues and encourage social change. The Catholic church took advantage of the entertainment value of theatre to create passion plays, mystery plays, and morality plays. There are a variety of philosophies, artistic processes, and theatrical approaches to creating plays and drama. Some are connected to political or spiritual ideologies, and some are based on purely "artistic" concerns. Some processes focus on a story, some on theatre as event, and some on theatre as catalyst for social change. According to Aristotle's seminal theatrical critique Poetics, there are six elements necessary for theatre: Plot, Character, Idea, Language, Song, and Spectacle. The 17th century Spanish writer Lope de Vega wrote that for theatre one needs "three boards, two actors, and one passion". Others notable for their contribution to theatrical philosophy are Konstantin Stanislavski, Antonin Artaud, Bertolt Brecht, Orson Welles, Peter Brook, and Jerzy Grotowski. The most recognisable figures in theatre are the directors, playwrights, and actors, but theatre is a highly collaborative endeavour. Plays are usually produced by a production team that commonly includes a scenic or set designer, lighting designer, costume designer, sound designer, dramaturg, stage manager, and production manager. The artistic staff is assisted by technical theatre personnel who handle creation and execution of the production. Some[weasel words] theatre theorists argue that actors should study all of the commonly-taught acting methods to perfect their craft (though many others disagree), such as the Meisner, Stanislavsky, Strasberg, and Hagen acting methods. Theater, overall, encompasses people, ideas, and the works of art that result from their collaboration. Black comedy: Comedy that tests the boundaries of good taste and moral acceptability by juxtaposing morbid or ghastly elements with comical ones. Comedy: Comes from the Greek word komos which means celebration, revel, or merrymaking. It does not necessarily mean funny, but can focus on a problem that leads to some form of catastrophe which in the end has a happy and joyful outcome. Comedy of manners: Witty, cerebral form of dramatic comedy that depicts and often satirises the manners and affectations of a contemporary society. A comedy of manners is concerned with social usage and the question of whether or not characters meet certain social standards. Commedia dell'arte: A very physical form of comedy which was created and originally performed in Italy. Commedia uses a series of stock characters and a list of events to improvise an entire play. Domestic drama: Drama that focuses on the everyday domestic lives of people and their relationships in the community where they live. Farce: A comic dramatic piece that uses highly improbable situations, stereotyped characters, extravagant exaggeration, fast pacing, and violent horseplay. Grand Guignol: Now broadly used to refer to any play with on-stage violence, the term originally referred to the bloody and gruesome melodramas produced at the Theatre du Grand Guignol in Paris, France. Melodrama: Originally, a sentimental drama with musical underscoring. Often with an unlikely plot that concerns the suffering of the good at the hands of the villains but ends happily with good triumphant. Featuring stock characters such as the noble hero, the long-suffering heroine, and the cold-blooded villain. Meta-Theatre: A genre of theatre made popular with mostly modern audiences, although it did start back in the Elizabethan Era. Meta-Theatre is when a play often completely demolishes the so called "fourth wall" and completely engages the audience. Often about a group of actors, a director, writer and so on. It usually blurs the line between what is scripted and what goes on by accident. Morality play: A morality play is an allegory in which the characters are abstractions of moral ideas. Musical theatre: A theatrical genre in which a story is told through the performance of singing (with instrumental music), spoken dialogue, and often dance. Natya: Sacred classical Indian musical theatre that includes natya proper (mime) and nritta (pure dance). Nautanki: A diverse Indian form of street plays consisting of folklore and mythological dramas with interludes of folk songs and dances. Opera: A theatrical genre in which a story is told and emotion is conveyed primarily through singing (with instrumental music). Pantomime: A form of musical drama in which elements of dance, mime, puppetry, slapstick, and melodrama are combined to produce an entertaining and comic theatrical experience, often designed for children. Poor Theatre: Jerzy Grotowski coined the phrase "poor theatre" in reference to the work he was doing with his theatre troupe in Poland. Grotowski's style of poor theatre consisted of many important fine points. For one, there was not a separate stage and place for the audience; instead the actors and the audience shared the same space. There were no sets, props, lighting, music, or any other technical features. The actors were paramount, although their costumes were simple. Grotowski had his actors go through physical training, and even would spend many months rehearsing a play. Some of these poor theatre plays would only be performed once, to a small audience. This theatre style was very popular during the 1960’s and 70’s, and later on, was used by many acting troupes around the world. Physical theatre: Theatrical performance in which the primary means of communication is the body, through dance, mime, puppetry and movement, rather than the spoken word. Rock opera: Concept albums and stage works performed in a dramatic context reminiscent of opera, except that the musical form is rock music. Romantic comedy: A medley of clever scheming, calculated coincidence, and wondrous discovery, all of which contribute ultimately to making the events answer precisely to the hero's or heroine's wishes, with the focus on love. Theatre of the Absurd: Term coined by Martin Esslin to refer to playwrights in Europe and the United States after World War II whose work reflected a sense of being adrift in a world where known values had been shattered. No playwrights ever dubbed themselves "Absurdists," although it has become commonplace to refer to Samuel Beckett, Eugène Ionesco, Harold Pinter, and Jean Genet, among others, by this term. It can be seen as related to the philosophy of existentialism. Total Theatre: Most frequently invoked in reference to Richard Wagner's concept of a Gesamtkuntswerk, or "Total Art Work," in which music, drama, and dance operate together. It has also been used by artists such as Steven Berkoff, who created a style where the actors become both characters and set, often using just one prop throughout the entire play. 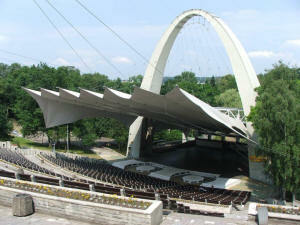 The style uses features of Greek theatre (eg. a chorus or didactic message), exaggeration and surrealism. Tragedy: A drama that treats in a serious and dignified style the sorrowful or terrible events encountered or caused by a heroic individual. The word "Tragedy" comes from the Greek word "Tragos" which is translated to "Goat". The original meaning may come from the mystery plays of the cult of Dionysos, which centered on the god being killed and his body ripped to pieces, and with a goat or other animal as a proxy for the bloodshed. Tragicomedy: A drama that has a bitter/sweet quality, containing elements of tragedy and comedy. The movie palaces of the '20s, '30s and '40s seem unbelievably extravagant when compared with the movie houses that came before and after, but when they are contextualized within the rise of America's consumer culture and placed alongside other public buildings of the period, their extravagance becomes 'readable'. The United States pioneered an economy based on mass production and was the first country to create mass consumer institutions and mass consumer entertainments. The picture palace is one manifestation of this. As corporatized mass production replaced localized, smaller units of production, Americans became more dependent on wages, salaries, and currency. Systems of barter and exchange which had supplemented currency in eighteenth century American households dried up. In middle class households, as historian Jeanne Boydston has noted, this translated into new roles for husbands and wives: husbands became 'breadwinners' and wives became managers of the domestic economy whose chief task was to stretch the dollars their husbands brought home. In lower class families, this division was elided as often the labor of all able-bodied members of the family was required to earn enough cash for city rents and food. Mass production and urbanization led also to an increasing dependence on "goods made by unknown hands. "(2) Advertising, in its nascent professional form, made mass produced goods sound not only necessary but desirable. Writing in The Atlantic Monthly in 1867, James Parton labelled the sewing machine "one of the means by which the industrious laborer is as well clad as any millionaire need be. "(3) For many immigrants, ready-made clothes transformed them into 'Americans'. By the late 1890s, overproduction of goods caused American businessmen to fear glut, panic, and depression. Businesses needed to 'push' merchandise and create a sense of need for mass-produced goods. This was accomplished through advertising and the creation of new public centers of consumption. Larger sheets of plate glass allowed for a whole new kind of retail display, the department store window. Writing in Chicago in 1911, Edna Ferber called the store window "a work of art...a breeder of anarchism, a destroyer of contentment, a second feast of Tantalus. "(5) The packaging and display of goods became a chief concern of retailers and a whole new breed of store employee, the window trimmer, came into existence. Although he is better known as the author of The Wizard of Oz and other works. L. Frank Baum was a pioneer of window display design: he founded the National Association of Window Trimmers in 1898 and published a journal called The Store Window, an industry standard. Other journals like The Dry Goods Economist advised retailers in the arts of drawing customers and moving merchandise. An article in The Dry Goods Economist counselled store owners to dismantle doorsteps and replace swinging doors with revolving doors in the belief that "no hindrance should be offered to people who may drift into the store. "(6) 'Drifting in' was made easier by advances in mass transportation, notably the streetcar. and ads were renewed monthly or yearly. In 1848, the New York Herald announced that its ads would be renewed daily. Managing Editor Frederic Hudson explained that ads would henceforth be considered a "feature" of the Herald and expressed his belief that ads "form the most interesting and practical "city news." They are the hopes, the thoughts, the joys, the plans, the shames, the losses, the mishaps, the fortunes, the pleasure, the miseries, the politics, and the religion of the people. "(8) Shortly thereafter, advertisers convinced newspaper publishers to do away with the agate rule and the column requirement: John Wanamaker placed the first full page ad in a daily newspaper in 1879. The message advertisers employed reinforced idolatry of the upper class even while it professed to surmount class distinction. Roland Marchand calls this message "the parable of the democracy of goods." Equality came to mean equal access to consumer goods rather than equal access to the means of production, and consumers were counselled that they could share the lifestyle of the aristocracy by buying the right toothpaste, breakfast cereal, or automobile. Manufacturers encouraged the worship of wealth through brand names: DuBarry lingerie, Pompadour silks, Imperial underwear, Regina petticoats, Royal Typewriters, Royal Waist and Skirt Supporters, and Princess Loop-Belts were but a few of the products whose names implied a promised connection to class status. Commercial artwork of the time reinforced this. In his drawings Maxfield Parrish used figures and tales like Cleopatra, the Rubaiyat and the Arabian Nights to sell American manufactured goods. One of his drawings featured a courtier serving raspberry Jell-O to a renaissance king; in another, boys in doublets and tights took snapshots with Adlake cameras. The net effects of mass production, new centers of consumption and new methods of advertising were uniformity and the creation of consumer demand. Daniel Boorstin wrote, "As never before, men used similar, and similarly branded, objects...the fellowship of skill was displaced by the democracy of cash. "(13) This did not occur without opposition, however: populist and union movements in the 1880s, 1890s and into the twentieth century united farmers, reformers and industrial workers in opposition to America's consumer culture. Although they managed to articulate alternate visions of American life, they were unequal to their opposition, those who historian William Leach has termed "brokers" of commercial culture in America. According to Leach, these 'brokers' included corporate heads, government officials, bankers, real estate brokers, advertisers, journalists, religious leaders, artists, writers, and museum professionals. Leach notes that American consumerism has been supported by higher education. Schools like Harvard offered MBAs well before European universities. No MBA programs were offered in Germany or in England until the 1970s; at Harvard in 1930, 1,070 students earned degrees in marketing, advertising, retailing, finance, management, and consumer psychology through the Harvard Business School. This figure was triple the 1920 enrollment. During the same period, organized religion lent its support to the new culture of consumerism. Mainstream Protestant religions splintered into modern and fundamentalist branches in the 1870s and 1880s, paving the way for the growth of cults and mind-cure groups. A French cleric named Charles Wagner was one of the more interesting and well-known figures of the period. In 1901 Wagner penned a tract called The Simple Life which was a failure in France and an instant success in America; hundreds of thousands of copies sold in the New York area alone. In The Simple Life, Wagner rails against material, commercial culture's corrupting effect: "the abuse of showing everything, or rather, putting everything on exhibition; the growing incapacity to appreciate that which chooses to remain hidden...One sometimes wonders if society will not end by transforming itself into a great fairway with each one beating his drum in front of his tent." Wagner was also concerned about the absence of ties to the past. He wrote, "Instead of filling their houses with objects which say, "Remember," newlyweds garnish them with quite new furnishings that as yet have no meaning. "(16) Wagner's solution was less powerful or radical than his diagnosis. He was no advocate of communitarian or welfare enterprises, and he didn't counsel a return to 'the good old days': rather, he asked readers to be simple "in their own stations." They could do this by avoiding "pessimism" and "self analysis," instead endeavoring to be "confident" and "hopeful." Department store magnate John Wanamaker was one of Wagner's most ardent American devotees. Wanamaker bought thousands of copies of Wagner's book for his employees and friends and he ordered the construction of a small bungalow next to his expansive country home in Lindenhurst, Pennsylvania so that he could escape to the simple life when he had the urge. Thus, Wagner's message became assimilated into American consumer culture in much the same way that graham crackers, Kellogg and Post cereals, and the therapeautic sanatariums of Battle Creek, Michigan transmuted the millenialist message of the Seventh Day Adventists. A growth in the service economy after 1895 paralleled the popularity of mind-cure. After 1900 skyscraper hotels and chains of standardized hotels became increasingly common. Ellsworth Statler, owner of the first chain of standardized hotels for a mass market, rejected old notions of exclusivity in the luxury hotel business. He argued that service should be seen as a "salable piece of merchandise. "(18) Statler transformed luxury hotels into 'people's palaces' with rooms and services available for a range of prices from $1.50 up. The Pullman Company rechristened itself the Pullman Palace Car Company after it saw the huge popularity of the Pullman sleeping car. Pullman cars featured carpeting, chandeliers, walnut woodwork, and French plate mirrors at prices only fifty cents above standard sleeping cars. Pullman cars were available to consumers of any class, unlike European rail cars of the era. Pullman wanted to engage "the dormant fancies of the public until they grew into demands. "(19) Demand was so great that gradually all railways in the U.S. were converted to the wider gauge of rail required by the Pullman cars. American movie palaces drew significantly from this movement and reinforced it. In a 1929 interview, theater decorator Harold Rambusch called the movie palaces "a social safety valve in that the public can partake of the same luxuries as the rich, and use them to the same full extent. "(22) Theater operators and studio heads plugged into the architectural and advertising motifs of the day to transform the movies into a legitimate, and eventually dominant, form of discourse and entertainment in America. During the late nineteenth and early twentieth centuries, Americans enjoyed spectator entertainments like professional and amateur sports leagues, minstrel shows, circuses, vaudeville, light musicals, road shows, fairs and expositions. The earliest films were played on Kinetoscope machines that permitted only one viewer at a time. Rows of these machines were installed in Kinetoscope parlors and existing entertainment venues like penny arcades. Like department store owners, arcade operators attempted to attract customers through sidewalk displays and through wide entranceways with the doors set back or entirely removed. As theater historian Charlotte Herzog noted, this "made the space of the interior and exterior continuous. "(1) It became an enduring feature of movie theater construction. When technological advances permitted group screenings of motion pictures, the earliest audiences watched movies in small-time vaudeville houses, in town halls, churches, lodges, schools, playhouses, county fairs, amusement parks, circuses, and arcades. Traveling exhibitors like Hale's Tours circulated early films around the country. To the earliest audiences, films were technological curiosities or optical illusions; thus, the earliest films were billed by their projection machinery, not by title, stars, or subjects. Tally's Electric Theater in Los Angeles was the first permanent structure devoted entirely to movies. Built in 1902, it preceded filmmakers' relocation to the West Coast from New York and New Jersey and the establishment of Hollywood. Still, the movies' popularity proved lucrative enough that soon storefront theaters and "nickelodeons"--named by a Pennsylvania theater operator for the admission price--sprang up across America. Furnishing these theaters was an easy matter; often a sheet for the screen, ten or twelve rows of benches, a box for collecting admission (hence the term "box office") and a curtain separating the "lobby" from the screening room sufficed. Entrepreneurs reasoned that if motion pictures turned out to be a passing fancy, these makeshift theaters could easily be converted back into retail space. Nickelodeons sometimes featured ornamentation fabricated from pressed tin or sheet metal. Advancements in the use of plaster and terra cotta around 1910 allowed more permanent decoration that more exactly copied the ornamentation of "legitimate" theaters. The lower and middle classes bought the majority of tickets to nickelodeons, storefront theaters and traveling exhibitions. Upper class citizens lobbied for censorship and increased supervision of women and minors in movie houses. Respectable theater--opera and plays--had, by this time, expanded to include "big-time" vaudeville. These 'respectable' vaudeville houses catered to the upper middle class and, unlike their "small-time" counterparts, featured reserved seating and advance ticket sales. Architecturally, big-time vaudeville houses relied on classical facades to increase legitimacy and respectability, but their gaudy electrical displays on the sidewalk and the marquee often contradicted this image. These theaters attempted a fusion of high and popular cultures--the White City and the Midway of the 1893 World's Columbian Exposition rolled into one structure. The vaudeville houses attracted customers not only through the program, but through the amenities offered to patrons. The Colonial Theater, built in Boston in 1894, impressed the public with marble, mirrored foyers, plush seats, oil paintings, and personal lounge attendants. New York's Proctor's Pleasure Palace followed suit in 1895 with a roof garden restaurant, library, barbershop, and turkish bath all housed in an imposing Romanesque facade. By 1900, 67 big-time vaudeville theaters were in operation across America. Motion pictures made their mark on the upper classes when big-time vaudeville operators began including films as half the program in the theaters. Adolph Zukor exhibited Queen Elizabeth at the Lyceum Theater in New York in 1912; upper class audiences were impressed by the dramatic, stately subject matter and the appearance of Sarah Bernhardt, a respected stage actress, in the feature role. Filmmakers during this period produced a rash of movies which were little more than "staged theater" in an attempt to improve the industry's image with upper class audiences and government officials. During this time the first feature-length films were produced, which allowed film to become a narrative, instead of merely technological, device. Film historian Maggie Valentine contended that it was the development of feature film, like D.W. Griffith's twelve reel Birth of a Nation in 1915, which promoted the development of "feature" motion picture houses. The Regent was America's first motion picture palace and it opened in New York City in 1913. The Regent was located in a working class neighborhood uptown from the 'legitimate' theater district; however, a reporter for the Motion Picture News declared that the opening night audience "was the kind to be found at the best playhouses. Judged by their decorum and sincere appreciation, they might have been at the opera. "(2) The reporter recommended higher admission prices and a move to Broadway. Before long, his wish was granted: in rapid succession the Strand, Rialto, and Rivoli picture palaces opened, finally taking their place alongside 'legitimate' theater. Samuel L. Rothapfel was the man responsible for the appeal of these movie houses. Rothapfel presided over all of them in succession and instituted the practices of low admission (lower than legitimate theaters and big-time vaudeville) and unreserved seating. Rothapfel, or "Roxy" as he became known to Americans in subsequent years, spoke thus on the secret of his success: "Giving the people what they want is fundamentally and disastrously wrong. The peole don't know what they want. They want to be entertained, that's all. Don't give the people what they want--give 'em something better. "(3) Like advertisers of the age, Roxy excelled in creating demand for environments and amenities customers didn't know they wanted. Each theater he opened had to be more lavish than the last; advertisements lured patrons with promises of "the biggest," "the grandest," "most expensive." Many of the studio heads, architects, and picture palace managers were first generation Americans: among them William Fox, a Hungarian; Samual Rothapfel, son of German and Polish immigrants and resident of New York's Lower East Side; John Eberson, Austrian architect; and Thomas Lamb, Scottish architect responsible for over 300 picture palaces, primarily for Loew's. Their experiences as first generation Americans might have given them a different perspective on American consumer culture, but instead they became some of its most ardent champions, and their theaters became some of its most unforgettable monuments. The architects and operators of America's picture palaces inscribed their buildings with democratic, national purpose in an attempt to bolster the industry's image and to attract customers. This display began with the buildings' exteriors and lobbies. A statue of a sphinx bearing the head of George Washington sat in the lobby of Grauman's Metropolitan Theater, built in 1923 in Los Angeles. The inscription on the statue read: "You cannot speak to us, O George Washington, but you can speak to God. Ask Him to make us good American citizens. "(1) Cleveland's Loew's State lobby drew attention for a mural by James Daugherty titled "The Spirit of Cinema." A local paper described it as follows: "The spirit of cinema appears in the American tableau. Here the modern vamp supplants Helen of Troy; jazz drowns the pipes of Pan; an auto supercedes the chariot; a flying machine outruns Pegasus; towering skyscrapers overtop the temple-crowned Acropolis;...the Boy Scout takes the place of the shepherd boy...the composition is rush hour. "(2) Daugherty and others were making claims about American motion pictures reminiscent of Emerson and Whitman nearly a century earlier: namely, that America required a truly indigenous art form and that in that art, she could surpass anything Europe had ever produced. Daugherty's claims are odd, however, when one considers the architecture of the movie palaces. Most palaces, particularly in their exteriors and lobbies, made express reference to European architectural forms and European aristocracy. Although theater architect George Rapp called the movie palace a "shrine to democracy, where wealthy rub elbows with the poor," his was a vision of democracy which prized aristocracy. (3) Thus, 'homegrown' notions about native architectural and artistic forms did battle with claims to legitimacy and dazzling displays of wealth rooted in Old World conceptions of abundance and legitimacy. This confusion is perfectly embodied in Chicago's Southtown Theater. Rapp and Rapp designed the theater in 1931 as an enclosed Italian garden; the lobby, however, features murals and dioramas of significant moments in Chicago history, including the fire of 1871, the 1893 World's Columbian Exposition, and the stockyards. 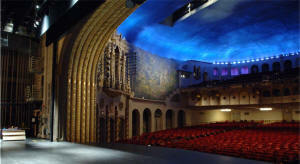 San Francisco's Fox Theater, built in 1929, housed a lobby that was a temple to European high culture and aristocracy. In a practice reminiscent of America's robber barons furnishing their homes, William Fox's wife Eve Leo toured Europe and shipped home various objets d'art, furniture, and architectural embellishments to be displayed in the theater lobby. Built and decorated by European craftsmen, the lobby featured throne chairs, statuary, and a pair of vases once owned by the royal family of Russia. Thomas Lamb designed the lobby's picture gallery to be an exact duplicate of a chapel in Versailles. Many theater exteriors and interiors were designed as replicas of Old World churches, monuments, and palaces. La Salle de Spectacle, the opera house at Versailles, served as the model for the Ringling Theater, constructed in Baraboo, Wisconsin in 1915. The frieze in the theater lobby is a copy, at 1/3 scale, of the frieze decorating the choir gallery in the cathedral in Florence. Theater lobbies promised admission not only to a motion picture, but also to the same 'generic aristocracy' Orvell described. At the Roxy Theater in New York, up to 4,000 patrons at a time could comfortably fill the lobby and foyers to marvel at the five story marble columns and the largest oval rug in the world. Samuel "Roxy" Rothapfel christened this room the "Grand Rotunda" and fired any usher who referred to it as a mere 'lobby.' Since the box office was a separate unit housed under the marquee on the street, customers could easily forget the commercial function of the theater upon entering the lobby and believe themselves members of a class comfortably at home in palatial surroundings. Commercialization of the lobby didn't occur until the Depression, when concessions stands, accounting for 45% of theater profits, became necessary fixtures in movie palaces. Just as the Pullman cars and downtown hotels of the period made aristocratic services and amenities available to the general public, movie theaters pampered customers with a virtual army of staff servants and luxurious 'extras.' Thomas Lamb originally designed the San Francisco Fox to include a 1,000 room luxury hotel; thus, instead of 'visiting' the palace, moviegoers could reside there. The Fox also provided footmen outside the theater to assist patrons arriving and departing by streetcar. Valets catered to those traveling by auto. The largest picture palaces like the San Francisco Fox and the Roxy provided for patrons' medical emergencies through fully-staffed hospitals. The Roxy hospital employed a staff of physicians, surgeons, and nurses and treated over 12,000 patients in its male and female wards during the first year of operation. Nurseries were available in most palaces; some theaters, like the Loew's 72nd Street in New York City, even boarded pets. Every movie palace featured smoking lounges, restrooms, and powder rooms as lavishly appointed as the lobby and auditorium. Theater operators staffed the lounges with personal attendants and decorated them to simulate the life of the wealthy. In some cases, that simulation was quite direct. When the Manhattan townhouse of the Vanderbilts was demolished in the mid-1920s, Loew's bought much of the interior. Workers dismantled the Vanderbilt's Oriental Room and transported it in pieces to Kansas City in 1927, where it became the Women's Lounge of the Loew's Midland Theater. Theater ushers often wore elaborate livery and were drilled with military precision to provide impeccable, efficient service to theatergoers. Ushers at New York's Regent wore "scarlet tunics piped in gold and looped across the front with more gold and tassels. Each of them carried a swagger stick with mother of pear tips that lit up in the dark. The Head Usher carried a Bugle. "(1) An ex-Marine drill sergeant provided ushers at the San Francisco Fox with 100 hours of training before their first day of employment; at the Roxy, management screened usher applicants for "charm, poise, no fallen arches and a haircut" before their training began. (2) Training included a week of military school, etiquette classes, summer camp in the Catskills, study halls, and self-selected fraternities. Department store employees like those at Wanamaker's enjoyed the same sorts of amenities, including employee restaurants, clinics, branch libraries, educational programs, and athletic facilities. In exhange for these facilities, department store owners and theater operators demanded tireless, unflaggingly courteous service. The Roxy Head Usher inspected his staff before each shift, read them promotions and citations, and marched them to the Grand Rotunda. There, at 6 p.m. every day, patrons could fancy themselves Windsors as they watched a Changing of the Guard ceremony. The eclectic mixture of American and foreign forms which characterized the movie palaces' exteriors and lobbies continued in theater auditoriums like the Loew's Paradise in Brooklyn. In the Loew's Paradise, stuffed pigeons strutted next to busts of everyone from Lorenzo de Medici to William Shakespeare to Ben Franklin in a Venetian Renaissance courtyard facsimile. The auditorium's most noteworthy aspect, however, was its fusion of religious and commercial purpose in forming a new American identity based on consumerism. At no place was this more blatant than at the Roxy, billed as America's "Cathedral of the Motion Picture." Workers used plaster and gold leaf to create embellishments on the pulpits which flanked the stage. Moviegoers attending opening night ceremonies also marvelled at the frankincense issuing from air ducts throughout the nearly 6,000-seat auditorium. On opening night, ushers directed patrons to their seats in near-darkness; the opening ceremony began with the appearance of a spotlit, robed monk reading from a scroll, "Ye portals bright, high and majestic, open to our gaze the path to Wonderland, and show us the realm where fantasy reigns, where romance, where adventure flourish. Let ev'ry day's toil be forgotten under they sheltering roof--O Glorious, mighty hall--thy magic and thy charm unite us all to worship at beauty's throne." When the monk intoned "Let there be light," a switch was thrown to reveal the auditorium decoration and the orchestra rising out of the pit. (1) The monk's prayer--addressed to the buiding and its custodians, not to God--became a standard feature at every theater Roxy opened. Theater designers and decorators borrowed freely from non-Christian religions as well: the chandelier in San Antonio's Aztec, built in 1926, was a replica of an Aztec sacrificial calendar stone, complete with painted blookstains. Replicas of Indian farewell canoes served as chandeliers in the KiMo Theater in Albequerque, New Mexico. But the Gothic cathedral was by far the most popular religiously inspired theater design. Department store owners of the same generation secularized Gothic elements in Christmas displays. In the 1910s in Wanamaker's these displays featured replicas of medieval rose windows as well as entire facades of the cathedrals at Rheims and Chartres. In 1898 Wanamaker built a complete church--with its own organ and choir-- in the rotunda of his New York store. Wanamaker's drew customers with other European replicas and museum displays outside the Christmas season as well. In 1906 the Philadelphia store exhibited artifacts from the French Revolution, including "exact" replicas of the guillotined heads of Louis XVI and Marie Antoinette wearing their "genuine" coronation crowns. (2) Companies selling fake artifacts to urban retailers became profitable enterprises in the early 1900s. Theater architects responded to this craze with the creation of atmospheric theaters. The Houston Majestic, constructed in 1923, was the first of these theaters and its designer, John Eberson, went on to design more than 100 atmospheric theaters across the U.S. Eberson called his theaters "a magnificent amphitheater under a glorious moonlit sky...an Italian garden, a Persian court, a Spanish patio, or a mystic Egyptian temple yard. "(5) Besides satisfying a public craving for exotic escapism, atmospheric theaters cost about 1/4 the amount of standard picture palaces. Atmospheric theaters usually attempted to create the feeling of watching a film in an open-air courtyard under a starry sky. Theater architects like Eberson achieved this effect by painting the ceiling midnight blue and using a Brenograph magic lantern machine to project clouds and constellations on this 'night sky.' Brenographs also created special effects like Aurora Borealis, Babbling Brooks, Blizzards, Descending Clouds, Flying Angels, Birds, Butterflies, Fire and Smoke, Lightning, Storm Clouds, Fleecy Clouds, Ocean Waves, Rain, Sand Storms, Snow, Falling Roses, Rainbows, and Volcanoes in Eruption. The walls of the atmospherics were decorated to look like courtyards, complete with indigenous flora and fauna, in various exotic locales. The firm of Rapp and Rapp was more famous for its conventional theater designs, but it produced a few atmospherics as well, declaring in a manner reminiscent of landscape architects like Frederic Law Olmstead, "Theatergoers in the big cities need foliage, water displays, etc. to counteract urban congestion. "(6) Visitors to the Garden Theater in Greenfield, Massachusetts could pretend they were in the town square in a New England village, while customers of the Waikiki Theater in Honolulu found themselves in a simulated indoor tropical paradise. The discovery of King Tut's tomb in the early 1920s inspired a taste for Egyptian Revival architecture in America. Grauman's Egyptian, built in 1922, included a forecourt lined with mock tombstones and a robed Bedouin carrying a spear who paced the building's parapet all day long. The Detroit and St. Louis Fox theaters were decorated in a Persian style and were guarded by Turkish warriors armed with scimitars, who stood by the throne chairs in the lobbies. During a time when immigration from Asia was severely restricted, Americans' fascination with the Orient was growing. Theater designers felt the influence of Orientalism and responded with buildings like Grauman's Chinese Theater. Movie historian Ben Hall wrote about this theater, constructed in Los Angeles in 1927 and still a popular landmark, "If the Roxy in New York was the Cathedral of the Motion Picture, the Chinese was its High Pagoda. "(7) Before its redecoration in the 1960s, Seattle's Fifth Avenue theater was a near-perfect duplicate of the throne room of the Imperial Palace in Peking's Forbidden City. Literary critic Edward Said believed Americans' fascination with the the Orient was ultimately self-aggrandizing; he argued that the view of Asians as primitive, passionate beings inflated Westerners' sense of superiority. In a much later work, William Leach dismissed Said's theory and contended that Orientalism in the early decades of the century gave Westerners permission to indulge themselves and affirmed their consumer, material pursuits. Leach noted the popularity of L. Frank Baum's novels The Last Egyptian: A Romance of the Nile and Daughters of Destiny, both of which contrasted the "free and wild" Orientals to the "stiff Americans." Using language similar to that in mind-cure tracts and advertising campaigns, Baum rejoiced in his observation that Asians obeyed "only the dictates of their hearts spontaneously. "(8) Theater design encouraged the development of a new American ethic based on material gratification where all that was demanded was spectatorship and consumption. Theater historians have tendered various explanations for the lavish appointments in America's movie palaces. In her recent work on palaces designed by architect S. Charles Lee, Maggie Valentine contended that "the audience became the focus, and comfort and view became the first considerations" because "support facilities [like those needed in conventional theaters] were reduced to a two-dimensional wall and a projection booth. Thus, the need for an expensive fly tower and wings in which to store scenery was eliminated, as were dressing rooms, rehearsal rooms, greenrooms, shops, and storage. "(1) While this may have been the case in smaller, more remote movie houses, it was not the case in the major metropolitan de luxe palaces which served as the architectural inspiration for smaller, rural theaters. The Roxy floor plans called for five floors of dressing rooms, an animal room below the stage, a ballet room, a costume department, a laundry, a dry cleaning establishment, a hairdressing salon, a barbershop, and a unicycle garage to facilitate its nightly stage shows. In addition, the Roxy housed a music library of over 10,000 vocal numbers and 50,000 orchestrations, staffed with three full-time librarians, which was billed at the time as the largest music library in the world. The sheet music was put to good use by the Roxy's 110 piece orchestra which was led by four conductors. Overall, the theater also contained 14 Steinway grand pianos. Orchestra members and pianists performed onstage and in the lobbies and foyers of the Roxy during its opening night celebration, which also featured filmed greetings from the President and Vice President of the United States, the mayor, the governor, Thomas Edison, and 300 patients at Walter Reed Army Hospital arranged on a lawn to spell out Roxy's name. Three organists in green velvet smoking jackets labored simulataneously on gigantic Kimball organ consoles which rose from the orchestra pit; two other organs served the lobby and broadcasting studio. The organs originally accompanied silent films and often included sound effects to simulate birds, horses, whistles, autos, fire engines, planes, hurricanes, surf, rain, telephones, doorbells, trolley bells, and smashing crockery. The most grandiose organs featured stops reading "Love (Mother)," "Love (Passion)," "Love (Romantic)," "Quietude," "Jealousy," "Suspense," "Happiness," "Hate," "Mysterious," "Ruesome," "Pathetic," and "Riot," lest theatergoers be in doubt about the emotional states of those onscreen. (2) The organ in Denver's Isis Theater even included a lightning machine. In 1926 famed theater organist Jesse Crawford designed what was generally acknowledged to be the "Queen Mother of All Wurlitzers" for the Paramount Theater in Times Square. When John Philip Sousa's band played a week at the Paramount, theater managers stationed trained nurses in the aisles "to assist those overcome by the sheer magnitude of sound when the Sousa Band, the Paramount Grand Orchestra, and Mr. and Mrs. Jesse Crawford at the twin consoles of the Mighty Wurlitzer all joined together in their rendition of "The Stars and Stripes Forever. "(3) Crawford's achievement was eclipsed by the triple console organ at the Roxy in 1927, the Moller De Luxe at the Atlanta Fox in 1929, and the massive Wurlitzer at Radio City Music Hall in 1932. By 1932, however, silent films were a thing of the past, and theater organs were chiefly instruments for congregational singing and for accompanying stage shows. Sometimes stage shows were standardized traveling shows, the most famous of which were Fanchon and Marco's "Ideas" in the 1920s and '30s. Often, however, individual theater managers developed them to fit thematically with the motion picture playing at the time. When Grauman's Chinese Theater opened with Cecil B. DeMille's 13-reel King of Kings in 1927, theater managers preceded the film with a biblical staged prologue that was, in the words of one critic, "the damndest thing this side of Oberammergau. "(4) Other theater managers built shows around the conductors' personalities or around contracted celebrities. Jack Partington was one theater operator who favored this last approach to stage shows. Partington was a former private detective and nickelodeon operator who made it big in 1921 by patenting his "Magic Flying Stages" which allowed performers to ascend, descend, and travel horizontally on electronically moveable sections of the stage. Stages also included elaborate prosceniums and curtains to showcase performers. The curtain at the San Francisco Fox cost $8,900 when workers assembled it out of gold kid, padded lame, 2,500 glass reflectors, and silk rope fringe in 1929. Stage shows held such appeal that Samuel Rothapfel got the idea to broadcast them over the radio nationwide. Roxy himself narrated the show and the film. His broadcasts proved so popular that they became a separate commercial entity and required the creation of a separate broadcasting room in the theater. People nationwide listened to Roxy's Gang, broadcast from the basement of the Capitol Theater (later moved to the Roxy, along with Roxy himself) with an orchestra under the direction of Eugene Ormandy. The advent of talkies spelled the death of elaborate, live stage shows as studio heads found it cheaper to film stage shows and provide theatergoers with 'virtual spectacles' during the economizing years of the Depression. Theaters wishing to stay afloat had to find ways to attract customers whose leisure dollars had dried up. At the Roxy Theater, Samuel Rothapfel's successor (Roxy had left to manage Radio City Music Hall) built a miniature golf course at the back of the theater lot and included golf in the price of admission. Other theaters promoted themselves through dish nights or bank nights and gave away housewares and money as door prizes. Despite these measures, many theaters and studios declared bankruptcy. San Francisco's Fox Theater went dark in 1932, just three years after its opening, when William Fox defaulted on the rent. The theater went into receivership and Fox declared bankruptcy shortly thereafter. His studio was reorganized as Twentieth Century-Fox in 1935 and resumed film production. Paramount suffered a similar fate: receivership in 1933, bankruptcy, and reorganization in 1936. Loew's was part of Fox when it went into receivership, but it emerged separately as MGM a few years later. RKO declared bankruptcy in 1934 and reorganized in 1939. Universal sold its theaters as a stopgap measure but went into receivership anyway in 1933, to be reorganized in 1936. Only Warner Brothers, Columbia, and United Artists survived the Depression with their theater empires intact. Sixty million people still visited the movie palaces each week in 1932, but if they attended one of the newer theaters they were likely to encounter a different sort of architecture. During the 1930s, Art Deco replaced other styles of theater architecture to become the standard in palace design. The first Art Deco palace, designed in 1930 by Marcus Priteca, was the Hollywood Pantages at Hollywood and Vine in Los Angeles. Movie historians have offered differing and sometimes conflicted explanations for the switch to Art Deco during the '30s. Maggie Valentine wrote that Art Deco theaters "reflected the hard times in which they were built" and displayed "an optimistic rejection of the pre-Depression boom that had culminated in a bust. "(3) David Naylor echoed this when he wrote, "Clearly tastes had changed. No longer did moviegoers expect a royal welcome from doormen, ushers, and lounge attendants. The architectural treatments of movie palaces were now considered exuberant, if not downright wasteful. "(4) However, Radio City Music Hall, one of the most impressive displays of Art Deco architecture, was christened with the belief that it would resurrect American consumerism: in its grand scale and at its core, it was an affirmation, not a rejection, of the culture of the 1920s. Valentine offered another explanation for Art Deco theaters, one which tied theater architecture to film content. She argued that the exotic decor of the early palaces reflected the silent, exotic nature of film during that period. Film in the 1930s, however, turned to romance and domesticity; Ginger Rogers and Fred Astaire demanded an Art Deco showcase. She also wrote that by the 1930s, moviegoing was a "socially acceptable form of behavior and no longer needed an architectural defense," hence the ability of theater architects to dispense with classical, Old World references. (5) The wide use of the Art Deco style in other buildings of the period, however, weakens Valentine's argument that it somehow arose organically from the film industry or from film content. 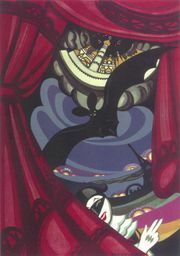 Although movie palace historians like David Naylor would have readers believe that Art Deco symbolized boredom with Old World styles and was somehow especially American, in fact it is equally European; it takes its name, in shortened form, from the Exposition Internationale des Arts Decoratifs and Industriels held in Paris in 1925. The Expo traveled through the U.S. in 1926 and proved, along with the 1931 "Industrial Style" exhibit at the Metropolitan Museum of Modern Art and the Bauhaus movement of the 1930s, to exert considerable influence on American architects and designers. What was American about it, if anything, was what American architect Russel Wright called its "grand scale, bold, vital form, distinctive colors, no matter how vulgar," seen almost everywhere: factories, skyscrapers, kitchens and bathrooms, gas stations, movie theaters, and cafeterias. Wright argued that in America this architecture was "not a means of elevating popular American taste, particularly, but a way of confirming it; designed goods become part of a larger set of things...eliding the differences between engineering and architecture, between vernacular and high culture. "(6) Since its earliest days as a commercial entertainment, film (and its near relative, vaudeville) struggled to elide the gap between upper-class and working-class notions about cultured entertainment, so perhaps Art Deco was somehow symbolically appropriate as an architectural style, but this should not be confused with the idea that Art Deco somehow emanated from film. Speakers like Miles Orvell and Russel Wright mention the influence of machinery and technology repeatedly in their comments on the new architectural styles of this period. Architects employing earlier styles, including the architects of early movie palaces, worked hard to keep machinery and mechanics 'behind the scenes.' Allen Trachtenberg wrote that while "engineers designed inner space in response to the new functional needs, architects took as their problem the design of appropriate 'fronts' out of the standard vocabulary of styles and motifs...as buildings stretched upward...their inner work...receded from view, from intelligibility, and from criticism...mystified the larger organization of life. "(9) Although some critics saw the early movie palaces as "gaudy horrors" that "stink with class," the majority sided with the journalist reporting on the opening of the San Francisco Fox when we wrote, "it was a spectacle of such beauty and magnitude that it seemed a fancy of one's mind rather than the inaugural night of another commercial enterprise. "(10) Movie palace architecture of the '10s and '20s obscured anything commercial or technological and, like the advertising of the period, assured moviegoers that they could achieve equality through consumption. Their vision of what was eminently consumable encompassed Old World, aristocratic forms, originally dependent on handcraftsmanship and feudalism but now made available through mass production and corporate forms of ownership. By the heyday of Art Deco in the 1930s, to paraphrase Leo Marx, 'the machine in the garden' could no longer be the elephant in the living room everyone pretended not to see. Through Art Deco, people on both sides of the Atlantic--but perhaps especially Americans, in light of the Great Depression--acknowledged the presence of and their growing dependence on 'machines' in the widest sense of the word. In the U.S., this included machines that were political and bureaucratic as well as technological: witness the phenomenal growth of the Federal Government, even before World War II. Despite the Great Depression and what it implied about American corporate and financial practices, or perhaps because of the widespead devastation the stock market crash created, Americans had to own that consumer culture was firmly engrained in Americans' work, play, ethics, and relationships with one another. The picture palaces which survived the Great Depression and the new theaters constructed following studio reorganization enjoyed a renaissance in the 1940s. During World War II, movie theaters hosted newsreels and war bond drives, attracting patriotic and news-hungry Americans by the millions--85 million each week. (Theater attendance was half that figure a decade later and in 1991 it was only 18.9 million per week. )(1) Americans packed in existing movie palaces during the war, as a building ban stateside stopped construction of new theaters during the first years of WWII; the Armed Forces and the Medical Corps commandeered all new projection equipment to show training films. In 1943, however, a study commissioned by the Navy concluded that a lack of movie theaters stateside contributed to delinquency and high labor turnover; the Navy urged construction of new theaters and the industry obliged. During the '40s theater builders relied heavily on concrete and glass, which were the most abundant nonrestricted materials available to them: other building supplies were used first for the war, and then for housing following the soldiers' return. Cinema attendance reached its all-time American high in the years following V-J Day. The revival was short lived, however: the tide of American consumerism which had propelled the movie palaces to prestige and profitability contributed to their decline in the late '40s and '50s. By then, 'a chicken in every pot' metamorphosed into 'a car in every driveway' and 'a television in every living room.' Americans' pursuit of the material Good Life led them to a suburban exodus. Suburbanization, facilitated by the federal government and auto makers in Detroit, and the lifestyle it called for spelled doom for downtown movie palaces. The government contributed to the growth of the suburbs through subsidies for interstate construction, the GI Bill, and the FHA mortgage program. It addressed itself more directly to the movie palaces when the Supreme Court declared the movie industry's vertical integration unlawful in 1948. Studios were forced to divest their theaters, many of which could not survive as independents without Hollywood subsidy. Television played a role as well. Between 1947 and 1957, 90% of American households acquired a television. (2) Newsreels were a thing of the past by the early '50s; TV news broadcasts meant people could get the same information without leaving home. Theater owners tried various gimmicks to entice customers away from their sets, including wide screen, Cinerama, and 3-D motion pictures, all of which meant the renovation of existing theaters to accomodate a wider screen and thus the destruction of many elaborate movie palace prosceniums and organ grilles. Theater owners altered their buildings in other ways as well during this period, primarily to accomodate the growing number of patrons arriving by automobile. The demand for free parking required the expansion of existing lots and, for the convenience of drivers dropping off passengers for the show, a whole new 'drive through marquee' came into being. At theaters like the Arden in Lynnwood, California, drivers could drop off passengers at the lobby door and purchase tickets without leaving the car. It was a short step from the drive-through marquee to the drive-in theater, although there were a number of drive-ins operating before the end of World War II. The first drive-in opened in June 1933 in Camden, New Jersey. By 1947 there were 548 in operation, a figure which mushroomed to over 4,000 by the mid-'50s. (3) Drive-ins continued many of the amenities offered by movie palaces and supplemented them with new ones geared to an automobile- and family-oriented society: playgrounds, miniature golf, swimming pools, pony rides, miniature trains, bottle warming, and automobile service stations were among the choices. For those still wishing to sit down inside a theater, but reluctant to travel all the way to downtown movie palaces, architects and builders created the neighborhood movie house. The neighborhood theaters were scaled-down versions of the palaces. Although they featured many of the same architectural elements as the palaces, including the stand-alone box office and the highly visible marquee, neighborhood houses were typically limited to one story containing several hundred seats. They dramatically reduced the services and 'extras' palace patrons had been accustomed to, like stage shows, organ-accompanied sing-alongs, nursery service and restroom attendants, and expanded profit-producing operations like concessions stands. In the wake of these developments, downtown movie palaces, like other downtown establishments including many department stores and luxury hotels, became a thing of the past. Countless theaters were razed. A few still stand, in partially denuded form, to serve as parking garages. Others were converted into performing arts centers or shopping centers. Ironically, some of these 'cathedrals of the motion picture' now house real congregations. Few public spaces in America have been able able to rival the grandeur of the picture palaces in the decades following their demise. These palaces are, no doubt, in some way symbolic of an industry dedicated to spinning fantasies, but they are also symbols of a transformational age in American life, the creation of a culture of consumption. Boorstin, Daniel J. The Americans: The Democratic Experience. New York: Random House, 1973. Boorstin's novel conceptualizations of different American 'communities' contributed to this work through Boorstin's careful accounting of the rise of advertising, departments stores, and mail-order retail businesses. Hall, Ben. The Best Remaining Seats: The Story of the Golden Age of the Movie Palace. New York: Clarson N. Potter, 1961. Hall's work is still the standard by which all histories of the movie palace are judged. Although Hall concentrates primarily on the career of Samuel "Roxy" Rothapfel and the theaters he managed, his exhaustive descriptions, deftly written, of stage shows and theater ornamentation does incorporate many of the most famous Midwest and West Coast palaces. Herzog, Charlotte. "The Movie Palace and the Theatrical Sources of its Architectural Style," Cinema Journal, Spring 1981: 15-37. Herzog traces the architectural elements of movie palaces to film's theatrical antecedents, namely circuses, vaudeville, and arcades. Kaufmann, Preston J. Fox...Story of the World's Finest Theatre. Pasadena, California: Showcase Publications, 1979. Kaufmann offers this work as a corrective to earlier, less favorable accounts of William Fox's career, and as a record of the San Francisco Fox for area residents following the theater's demolition. Kaufman provides rich detail about this theater and by following Fox's career, readers gain understanding about effects of the Depression, especially, on the film industry. Leach, William. Land of Desire: Merchants, Power, and the Rise of a New American Culture. New York: Pantheon, 1993. Leach's book is an impressive study of the department store's contribution to commercial culture in America. He is careful to contextualize department stores within the religious, corporate, and governmental framework of the age. Margolies, John and Emily Gwathmey. Ticket to Paradise: American Movie Theaters and How We Had Fun. Boston: Little, Brown and Company, 1991. This work is targeted towards the general reading public, but it does offer scholars access to wonderful photographs of movie palaces around the country, particularly those in more remote locales which are often missed by 'heavier' treatments. Margolies and Gwathmey have also collected reminiscences from celebrities and average citizens about their movie palace experiences. A great introduction to American picture palaces. Naylor, David. American Picture Palaces: The Architecture of Fantasy. New York: Prentice Hall Editions, 1981. Naylor's work is focused on preservation of old movie palaces and leans towards sometimes-nostalgic description, but the photography and Naylor's command of architectural vocabulary enrich the reader's understanding of American movie palaces. Orvell, Miles. The Real Thing: Imitation and Authenticity in American Culture, 1880-1940. Chapel Hill: University of North Carolina Press, 1989. Although Orvell doesn't have much to say about movie theaters, he provides thoughtful analysis about early film, most notably documentaries, and about the larger social milieu of the time. His comments about photography, facsimile and design were invaluable in preparing this work. Trachtenberg, Allen. The Incorporation of America: Culture and Society in the Gilded Age. New York: Hill and Wang, 1982. Trachtenberg's chronicle of industrialization and urbanization in America doesn't discuss movie theaters specifically, but it provides important information about creation of consumer society and the other downtown "people's palaces" of the era. Valentine, Maggie. The Show Starts on the Sidewalk: An Architectural History of the Movie Theater, Starring S. Charles Lee. New Haven: Yale University Press, 1994. Valentine's work is especially helpful for the study of later (Art Deco/Streamline Moderne) movie palaces, particularly those on the West Coast. Her comments about the impact of the automobile are insightful, and she provides a good summary about the movies' earliest years (especially the debt owed to vaudeville). She provides much information on theater architect S. Charles Lee which is woven (not always successfully) through the architectural commentary.